City of Oakland public lot. Metered. Free after 6pm and on Sundays and Holidays. Full bar and local sports game will be on if they are on a standard cable channel. Tomatoes, black beans, avocado, cucumber, grilled Onions, queso cotija, beet vin. We'd love to come back when the restaurant is not so busy and noisy, if that's possible. The food was excellent and there are many menu choices. There was not enough staff for a Sunday Brunch time. There was too much time between providing our orders and receiving them. It's unfortunate that businesses continue this trend of understaffing, therefore, causing inconvenience to the customers. I won't be returning to Bar Cesar as I no longer patronize other businesses that have this issue. My time and $$ are valuable and if you want either, increase your staff and provide service that your customers deserve. Great food and service. Victor is great. We arrived about 45 mins early and there was no one at the front to greet us. We walked in and sat at the bar since there was a couple of seats open. We had a great time at the bar, enjoyed our food and cocktails. We’ll definitely be going back. We have always had a great experience at Bar Cesar's. The food is very tasty - always! The service excellent. We have eatne at this Bar Cesar's (on Piedmont Avenue) probably 8 or 10 times and have never been disappointed. The food was very good! Haven’t been to Bar Cesar for a few years. It seemed to struggle for a while in the past. The other night I was very impressed. Service was very good and very attentive. Generally it was a very nice evening. Oh, and Wednesday’s the bottles of wine are 50% off so that was s very good deal! A good neighborhood place on Piedmont Ave. that's usually got a place for us when we want it. Mainly Mexican/ Californian food. Service is improving. It can be very very noisy at certain times. Servers were not friendly and had a really bad attitude the entire time. One server in particular did not seem happy to be working there which made our experience terrible. I gave 3 stars for service due not to our table server.... but to another worker who we tried to engage with over the margaritas. He was abrupt and dismissive. Our table server was sweet. Second date night with other half and our daughters. First time visit for our girls. Made reservations but wasn't thrilled where we were placed (patio area - benches are not comfortable and way too high). Menu was different than our first time visit and a bit more expensive. Aioli was a bit too spicy. That being said, will visit again but probably not in the near future. Good food at good prices, really warm, convivial atmosphere. Overpriced food, for the most part. Very small portions considering prices. Dishes could be elevated significantly. Creative and good tasting dishes! Friendly staff, good bar scene. I enjoyed my meal and will go back. Service was a little slow and am looking forward to going back. 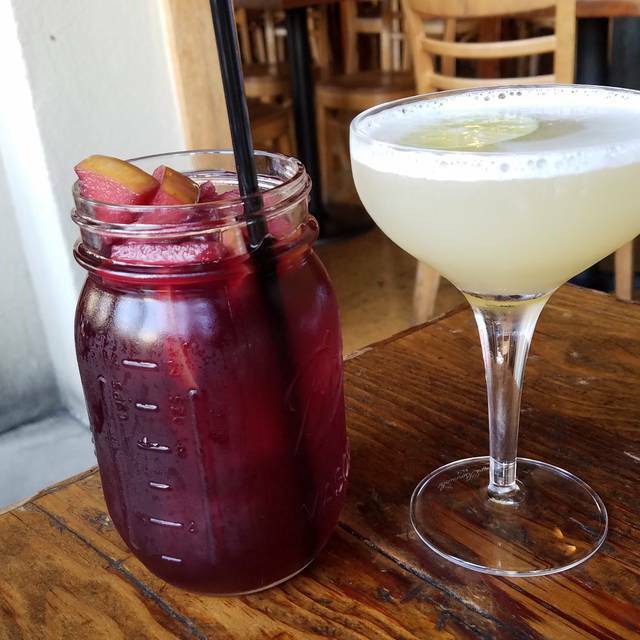 My friend and I tried the Restaurant Week menu and the all the options were so good and tasty, even the pomegranate lemonade was great. I’d definitely come back here! Bar Cesar has a good drink and food menu. The service was excellent and the vibe was fun. The tapas portions were perfect for our group. I highly recommend this restaurant for any get together. Excellent location on Piedmont Ave. Loved this place for a special occasion. In the heart of piedmont. Good ambiance and well meaning staff. Liked the food selection and vibe. Good for smaller groups have neighborhood feeling! My girlfriend and I went for brunch and we were quite impressed. My girlfriend had chorizo and eggs while I had the carnitas, potatoes, and two eggs. Both of our meals were outstanding. I could only eat half of mine and the other half made for a great breakfast the next day ! Oh....did I mention bottomless mimosas ? Overall great job and service as well ! We had a very uncomfortable lunch a Bar Cesar. We arrived to music so loud we could not even communicate. When I mentioned that the music was very loud one employee commented, "Well we just opened" very rudely. We were seated and after ordering it took 20 minutes for our appetizer soup to arrive though the place was still practically empty. The food was good and we enjoyed the meal itself but the service was lacking. When we finished our meal our plates were cleared and we asked for a container for some leftovers. We continued to chat and after some time realized that we had not yet recieved the bill. When I mentioned to the waiter that we had been waiting for about 20 minutes to get the check he rudely replied, "You arent my only table!" He then slammed the bill down on the table. After that he took our credit cards and dropped them on an ajecent empty table in the mddle of the restaraunt while he went off to do something else. A few minutes later he brought back the tabs and we left. I will never return there and I do not recommend this place to anyone. I should mention that we have eaten at the Berkeley location and loved it. It was my 2nd time here. The food is good and good ambience both times. The first time the waiter was very attentive and gracious, great service! The 2nd time a different waiter was more curt, less attentive to serving our needs and seemed to be more preoccupied and distracted with the female bartender. So the service was not great but the food was. The background salsa music is great but a little too loud to hear each other talk. Otherwise, I will return for the food and flight of tequila! We usually come here several times a year. The service this visit was definitely inattentive. The menu seemed less interesting than previously. The location is great - parking lot conveniently close. We were sorry to see the changes - maybe the restaurant changed hands since our last visit. A shame - because it has been one of our favorites. Food was really good. However entrées came first, followed by appetizers 15 minutes later, followed by drinks including water 15 minutes after that. Our waiter apologized after the fact, stating they experienced a rush. If so, they certainly could have managed better. We had a reservation; yet they continued to seat walkins beyond capacity. The classy thing to do would have been to comp our drinks. This would have gone a long way. I may give them a second try down the road because the food was so good, but I’m in no hurry. There are a lot of dinner options in the immediate area, and this was a particularly frustrating experience. Latin jazz with Anthony Blea was amazing! Hope you keep bringing them back. Great food, great service, fun crowd, good energy. Highly recommend! I've be the Oakland location multiple times, and I usually find it to be a fun night out with good energy and food. Recently however, I found the food just OK, and it was distressingly loud, with crying babies, a bachelorette party, and cell phone talkers. It no longer knows if it is a Mexican restaurant or a tapas bar and I might give it one more chance in case it was an off night, but my expectations were not met. Excellent food but service is lacking. This is the 3rd time we have been overcharged on our bill and we will not be back. Fun atmosphere. Great food and service! We had a group of 8 and service was amazing. Ordered tapas and tacos that were fabulous! Enjoyed the Happy Hour menu which includes tacos and drinks. Food quality is always great at a reasonable price. Service was absolutely horrible - server hid in the back chatting with people at bar and other staff members .. we had to flag down other servers over and over to get , water , lagging food items, the check to leave . Really disappointing . Food was no better , cold, bland and just soooooo average . Environment was way too loud and smelled like some sort of cleaner.. also not nice they keep the windows shut so you are in a green room sweating while trying to eat and listening to your neighbors at the other table yell talk in your ears . The food is tasty and interesting. Tempura avocado? Sounds weird and tastes great. Service quick and accommodating. Very loud, not as loud when sitting by the window. Roasted corn on the cob yummy . Only real complaint is the Margaritas are too small. I expect to go back often as it’s in my neighborhood. Enjoyed this return visit. The happy hour tacos were great with very prompt and attentive service. I had a good night at Cesar’s. We had a large group. All in all our tables were well taken care of. I plan to go back. We came to Bar Cesar as a family for Father’s Day. We were sat right away, and I noticed that a couple of the items my kids enjoyed our last time in (ribs, chicken tacos, Jarritos soda - about 10 months prior) were missing from the menu. The item my son wanted to order was out of stock, but our server did his best to answer menu questions for us and was very attentive, providing great service. 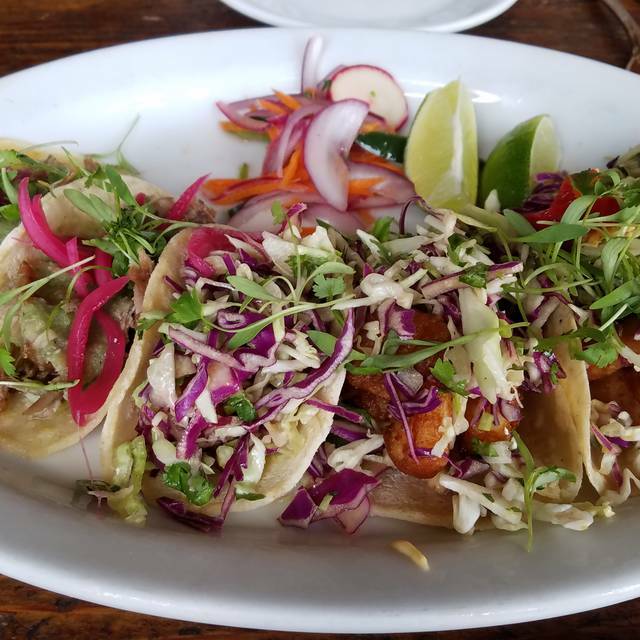 We order chips & guacamole, oysters, shrimp tacos, fish tacos, salmon tacos, rice & beans, and shoestring fries. All were delicious. Surprised at how quickly our meal was served. Accommodating host and servers. More people had showed up than what we had originally reserved for & we ended up staying for about 2 hours, and they were very accommodating. I would say this restaurant is on the pricey side, so double check the menu for prices beforehand.